In 1997 Philip Roth won the Pulitzer Prize for American Pastoral. In 1998 he received the National Medal of Arts at the White House and in 2002 the highest award of the American Academy of Arts and Letters, the Gold Medal in Fiction. He has twice won the National Book Award and the National Book Critics Circle Award. He has won the PEN/Faulkner Award three times. 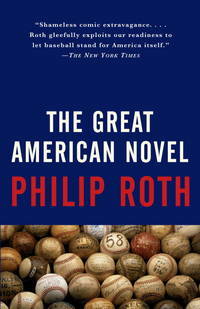 In 2005 The Plot Against America received the Society of American Historians’ Prize for “the outstanding historical novel on an American theme for 2003-2004.” Recently Roth received PEN’s two most prestigious awards: in 2006 the PEN/Nabokov Award and in 2007 the PEN/Bellow Award for achievement in American fiction. Roth is the only living American novelist to have his work published in a comprehensive, definitive edition by the Library of America. In 2011 he received the National Humanities Medal at the White House, and was later named the fourth recipient of the Man Booker International Prize. libriquarian (Asheville): Perhaps its just because I'm an unrepentant baseball fan (I'm also an unrepentant fan of alliteration and Philip Roth, too), but this, to me was my favorite Roth book. 1973-01-06. New. Ships with Tracking Number! INTERNATIONAL WORLDWIDE Shipping available. Buy with confidence, excellent customer service! Henry Holt & Co, 1991-05-01. Hardcover. Used:Good. Henry Holt & Co. Hardcover. 0805017348 . New. 1991-05-01. 2002-08-01. New. Ships with Tracking Number! INTERNATIONAL WORLDWIDE Shipping available. Buy with confidence, excellent customer service! Holt Rinehart and Winston, 1973-01-01. Hardcover. Used:Good. 2006-04-01. New. Ships with Tracking Number! INTERNATIONAL WORLDWIDE Shipping available. Buy with confidence, excellent customer service! 2015-08-18. Good. Ships with Tracking Number! INTERNATIONAL WORLDWIDE Shipping available. May not contain Access Codes or Supplements. May be ex-library. Shipping & Handling by region. Buy with confidence, excellent customer service! 2015-08-18. New. Ships with Tracking Number! INTERNATIONAL WORLDWIDE Shipping available. Buy with confidence, excellent customer service! Good. Offered by UK charity Langdon - supporting young men and women with disabilities. 1985-09-03. Good. Ships with Tracking Number! INTERNATIONAL WORLDWIDE Shipping available. May not contain Access Codes or Supplements. May be ex-library. Shipping & Handling by region. Buy with confidence, excellent customer service! Henry Holt & Co, 1991-05. Hardcover. Good. 2002-08-01. Good. Ships with Tracking Number! INTERNATIONAL WORLDWIDE Shipping available. May not contain Access Codes or Supplements. May be ex-library. Shipping & Handling by region. Buy with confidence, excellent customer service! New York: Holt, Rinehart and Winston, 1973. 8vo. 382 pp. Very Good, Soft Cover with water stains, sun-fading, rubbing & edge wear; lower corner of cover and first pages of text dog-eared; water stains on cover has bled and caused some discoloration of small portions of the first few pages of text; spine slanted; shelf wear. Uncorrected Page Proof. New York, Chicago, San Francisco: Holt, Rinehart and Winston, 1973. 1st Edition . Hardcover. Very Good/Very Good. 8vo - over 7¾ - 9¾" tall. The story of the Ruppert Mundys, big-league baseball's first permanent road team, that wanders from one city to the next during World War II. Stated first edition. First printing. Pages are slightly browned, but overall this is a clean copy with no writing, marks, or underlining save for a former owner's name and date on the front pastedown endpaper. No bookplates. No remainder marks. Not an ex-library copy. Spine is tight and crisp. Boards are flat and true, and the corners are square. Boards do have some sunning to the upper edges, as does the upper textblock edge where the dark blue color has faded a bit. Dust jacket is not price-clipped but does have some flaws, namely some browning, some creasing to the jacket flaps, and general shelf wear including a few 1/2" tears along the edges. This collectible, very good/very good, first edition/first printing copy is protected with an archival mylar dust jacket cover. Satisfaction guaranteed! Holt Rinehart and Winston. Hardcover. 0030045169 NEW ~ Tight & Bright, 1973 First Edition ~ perhaps lightly aged Hardback ~ We Ship within 24 Hours + FREE Tracking, answer emails fast, accept returns & work hard to deliver 100% customer satisfaction! . New. Henry Holt & Co. Hardcover. 0805017348 Good Condition. Has minor tearing. Five star seller - Buy with confidence! . Good. Penguin Books, 1985-09-03. Paperback. Used:Good. New York: Holt, Rinehart and Winston, 1973. 8vo., 382 pp., Very Good, Blue Cloth, Dust Jacket with creasing, small tears, staining, sun-fading, rubbing, & edge wear; stains on edges of text block; shelf wear. Mylar Jacket. First Edition. Farrar, Straus & Giroux, 1980. Paperback. Good. New York: Holt, Rinehart & Winston, 1973. First printing. Hardcover. Near Fine/Near Fine. 382 pp. Price of $8.95 on front flap of jacket. Textblock shows few traces of foxing; tiny chip on rear panel, else Fine. New York: Holt, Rhinehart, & Winston. Hardcover. Near Fine . Fine. 1973. First Edition. 2006-04-01. Good. Ships with Tracking Number! INTERNATIONAL WORLDWIDE Shipping available. May not contain Access Codes or Supplements. May be ex-library. Shipping & Handling by region. Buy with confidence, excellent customer service! Vintage. PAPERBACK. 0679749063 New Condition. . New. Holt Rinehart & Winston. Hardcover. B002FDLIC4 New Condition. . New. Holt Rinehart & Winston. Hardcover. B002FDLIC4 Like New Condition. . Fine. Holt First Edition. uncorrected proof, fine in wrappers. F. Soft cover. New York: Holt Rinehart and Winston, 1973. First Edition, First Printing. . Hardcover. 382pp. Hardcover. Deep blue cloth over boards with gilt (gold) spine lettering. Book condition: Owners blind stamp on ffep +half title, +title pages, else FINE. Binding is tight and square, edges are clean; luxurious blue topstained edge is fresh and unmarred. Dust Jacket Condition: Near fine. Inch+ scratch on the spine with some paper loss, somewhere in between a rip and a scratch. Corners creased on front and rear flaps. Correct price of $8.95 is intact. New York: Bantam, 1974. 8vo. 416 pp. Very Good, Paperback with sun-fading, rubbing, & edge wear; slight yellowing throughout; shelf wear. Volume tight, likely never read. New York: Holt, Rinehart and Winston, 1973. 8vo., 382 pp., Very Good, Blue Cloth, Dust Jacket with creasing, multiple tears, staining, sun-fading, rubbing, & edge wear; stains on edges of text block; shelf wear. First Edition. Harmondsworth, UK: Penguin, 1985. 8vo. 382 pp. Very Good, Trade Paperback with rubbing, & edge wear; yellowing throughout; shelf wear. New York: Holt, Rinehart & Winston, 1973. First Edition. Hardcover. Near Fine/Near Fine. An unusually nice copy in DJ of this relatively early work. New York: Holt, Rinehart and Winston, 1973. 8vo. 382 pp. Very Good, Blue Cloth, Dust Jacket with significant tears, staining, losses, sun-fading, rubbing & edge wear; some staining on edges of text block; although DJ has several tears, book itself VG; shelf wear. First Edition. New York: Holt, Rinehart and Winston, 1973. 8vo., 382 pp., Very Good, Blue Cloth, Dust Jacket with tears, curling, staining, sun-fading, rubbing, & edge wear; stains on edges of text block; shelf wear. First Edition. New York: Holt, Rinehart and Winston, 1973. 8vo., 382 pp., Very Good, Blue Cloth, Dust Jacket with creasing, small tears, curling, sun-fading, rubbing, & edge wear; stains on edges of text block; shelf wear. First Edition. New York: Holt, Rinehart and Winston, 1973. 8vo., 382 pp., Very Good, Blue Cloth, Dust Jacket with creasing, tears, curling, staining, sun-fading, rubbing, & edge wear; stains on edges of text block; shelf wear. Mylar Jacket. First Edition. New York, New York, U.S.A.: Holt, Rinehart and Winston, 1973. Book. Fine. Hardcover. First Edition. 1973 Holt, Rinehart Winston Stated FIRST EDITION in NF/VG+ condition. A gret copy of this early Roth novel, the HB has only a very small sticker shadow on the ffep. Otherwise there isno other wear. The unclipped DJ has a tad of yellowing along the edges and one or two tiny repaired tears..
New York: Holt, Rinehart & Winston, 1973. Stated first edition with $8.95 price on flap. A well-preserved, unclipped and unmarked copy with just a tiny (1/8") chip to the top edge of the front jacket panel, protected by a Mylar DJ cover.. First Edition. Cloth. Fine/Near Fine. Octavo. Vintage, 1995. Paperback. New. 8 x 5.3 cm. 1973-01-06. Good. Ships with Tracking Number! INTERNATIONAL WORLDWIDE Shipping available. May not contain Access Codes or Supplements. May be ex-library. Shipping & Handling by region. Buy with confidence, excellent customer service!